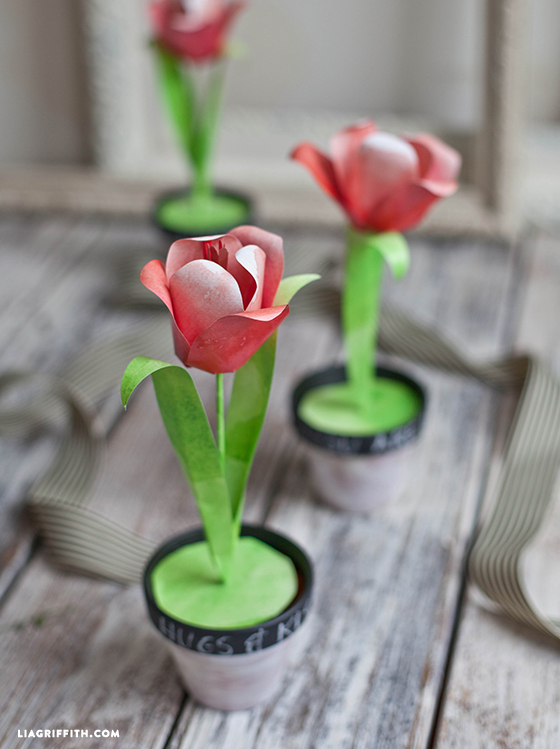 Paper flowers can be made from just about any kind of paper. I started my paper flower blogging with only printer paper and text weight metallic paper because I saw that there were a lot of crepe paper flowers already out there and my gift is to make patterns for the text paper that can look fluid and lovely by curling and shaping. Confession. . . it took me a few years to even pick up crepe paper since I like to be the original girl and not do what everyone else is doing. 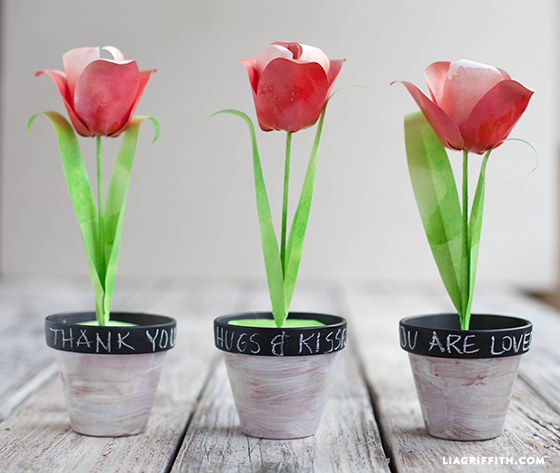 Lately, I have fallen in love with crepe and tissue for flowers and a few weeks ago I shared a crepe paper tutorial and pattern for paper tulips since less petals are more difficult to create fluid blooms from printer paper. I do love this crepe paper version. The other day this watercolor tulip that I designed and photographed for my former blog a few years ago popped up in a search and after remembering how pretty these watercolor tulips really are, I decided to share these as well. There is something very sculptural about these tulips and I do love the watercolor effect. Of course you can use them in a full bouquet, replace the skewer with a floral wire or use a few blooms as a gift topper. There are a lot of options. 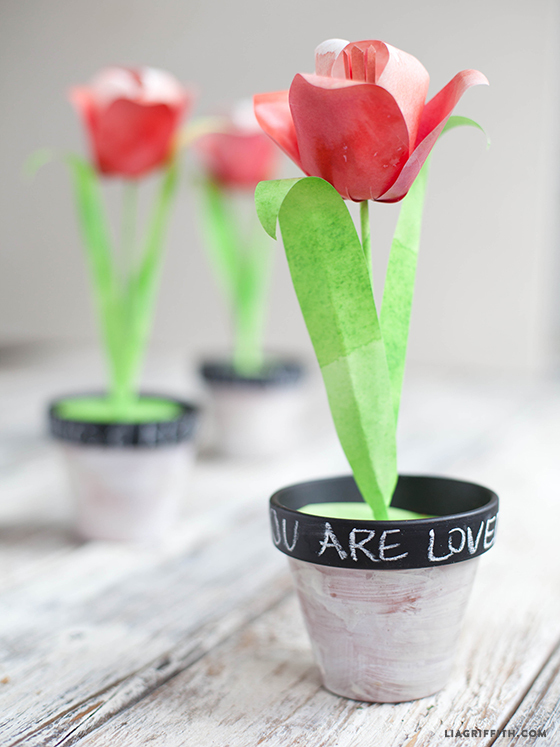 These single bloom pots with personal messages on the chalkboard painted rim are pretty adorable too. Again, all JoAnn stores within 50 miles is out of the Holiday Flowers and leaves. I have been trying to find these since Nov. Forget JoAnn’s and next year let us buy them from you. I really wanted this! I’m so sorry, I wish I had more control over the availability of the kits!! I really appreciate your support, and am sorry it’s been frustrating trying to find these. I am in the midst of making paper flowers for my upcoming wedding, and I am using sheet music (as my fiance and I are both musicians). Could you possibly post this pattern with just the outlines? Lia, I just found your site today and I just love it. You make beautiful flowers, thank you for sharing your expertise! So happy you are here!! Wow. This is amazing! Thank you so much for sharing this, and oh my goodness you are talented! I am on the hunt for cute little touches for decorating at a “T for two” themed bridal shower. 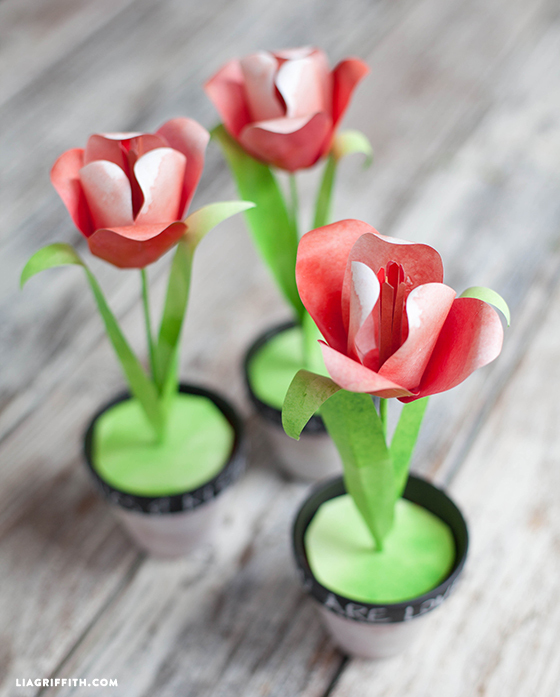 These tulips are perfect, and I was thinking I’d have to go buy special colored paper, or do some fancy trick with dye to get them looking like this… I was not expecting the pattern to just be a print, cut and glue! I CAN DO THIS! WOO HOO! You can do it!! I like to make it simple for you. Let me know if you need another color too. So pretty! Thank you for the very thorough directions with the many step-by-step photos. You are an excellent teacher, along with your many other virtues… Thanks, again! Lia, they are so beautiful, they remind me it is the tulip season, and the scene back then where we took pictures standing in the middle of the flower “field”. My son was four, five years old, and now he is 23. But it seems it is only yesterday, Love it. Thanks. Awww, that is so cute Edna! Love the story. They do grow up so quickly.